Anna Maria Stanziale first appears in Painesville, Lake County, Ohio, in 1928. Serafino Arcaro, and his wife, Anna Maria Stanziale, moved from Wickliffe, Ohio, before the birth of their first child, Michele, in 1928. In America, Anna Maria Stanziale was known by her married name, Anna Maria Arcaro. Anna Maria Stanziale, daughter of Emilio Stanziale and Nicoletta Ruberto, was born on Friday December 10, 1897, at Sant’Angelo in Grotte, Italy. Anna married Serafino Arcaro, son of Michele Arcaro, about 1920 in Italy. Anna Maria died on May 13, 1971, at Painesville, Lake County, Ohio, at age 73. Her body was interred at Riverside Cemetery at Painesville, Lake County, Ohio. Anna Maria Stanziale immigrated to the United States on September 2, 1927, at age 29, travelling to Wicklliffe, Lake County, Ohio. She was joining her husband, Serafino Arcaro, in Wickliffe. Anna became a citizen of the United States in 1943. She resided at 597 North St. Clair Street, Painesville, Lake County, Ohio, when she was naturalized. Anna Maria Stanziale had four brothers living in Painesville, Ohio. Her brother Nicola Stanziale migrated to Painesville in 1905. He passed away in Columbus, Ohio, in 1918. Giovanni Stanziale joined Nicola in Painesville in 1906. 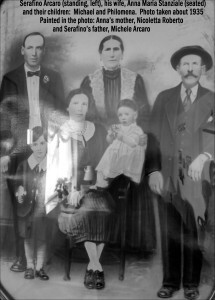 Brothers Antonio and Giuseppe migrated to Painesville in 1926. At the time of death, Anna resided at 597 North St. Clair Street, Painesville, Lake County, Ohio. 2. Philomena Arcaro was born June 25, 1932, at Painesville, Ohio. She married John Mirch.